Some time ago I was invited to my first ever black-tie dinner. Excited, I set out to find the perfect fitting tux, most stunningly crafted shoes and smartest watch I could afford at the time. That is what led me to buy the Seiko Chronograph Watch SPC059P1, a watch I have now owned for some years, and as far as I can tell discontinued by the company. 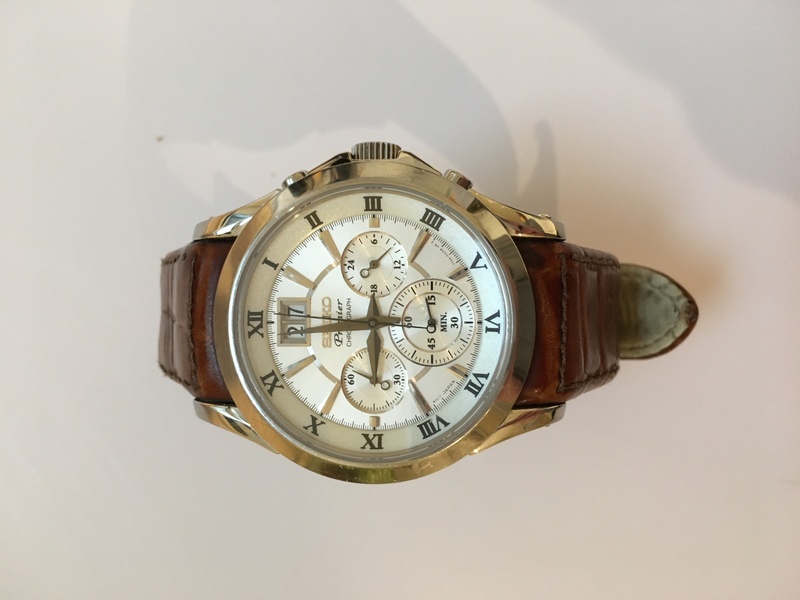 Although some similar watches are still made and are available to buy by the brand. With a smart, detailed but not overcrowded clean white face and high-quality calf leather strap, this watch is a true addition to the gentleman’s cabinet. Although certainly too classic looking to wear in very casual situations, the watch pairs perfectly with everything from a tuxedo down to semi-casual shirt and trousers office wear. Having worn this watch extensively over the last few years it has survived a fair few knocks with only minor scratching to the stainless-steel body. The only small downside I have found is after a time of considerable use, one of the small leather loops that holds the excess strap in place fell off. But this was easily fixed with little cost at a local jewellery store. Would I recommend this watch? Yes absolutely…if you can find one. True of the Seiko watch brand as a whole. If you are in the market for a smart, versatile watch in the £200-£400 price range you will be hard pushed to find a better quality and better-looking watch than this one. Just be sure to take care of the leather strap. Although discontinued, you can still find this watch floating around Amazon, eBay and specialist second-hand watch sellers. However, do expect to pay a premium for this now hard to find wrist piece. The closest similar watch I have seen made by Seiko is the much cheaper Seiko Men’s Analogue Quartz Watch with Calfskin Strap – SNDC31 which you can buy on Amazon.